January 29, 2015 January 29, 2015 by Beau H.
Editor’s note: Sometimes, items that project great style are hard to find, especially at good prices. These articles aren’t necessarily a reflection of deals or sales for a particular brand, but noteworthy picks at the moment that can be had for affordable prices. For more Online Shopping Picks, head here. Diving into a brand that’s steadily on the way up. In the past two to two-and-a-half years or so, Everlane is a brand that’s raised a lot of eyebrows in the online fashion community. Their model of radical transparency and their desire to disseminate lots of information about how they do what they do has been praised by lots, as much as their clean, crisp aesthetic has also garnered positive reviews. They’re among a rare set of brands (J. Crew would probably be another) that do both men’s and women’s apparel very well, especially when it comes to staple essentials. They’ve been steadily expanding their wares on both sides, and have got a whole slew of releases planned for this spring — among others, they just dropped men’s henleys and a luxurious-looking merino blazer. The brand also has a new sweatshirt release and a spring jacket upcoming. For those of us that can’t wait though, there’s plenty of great goods on the site now. Check out picks below and share your thoughts on Everlane beneath that! A much-anticipated drop from Everlane that hopefully lives up to the hype. 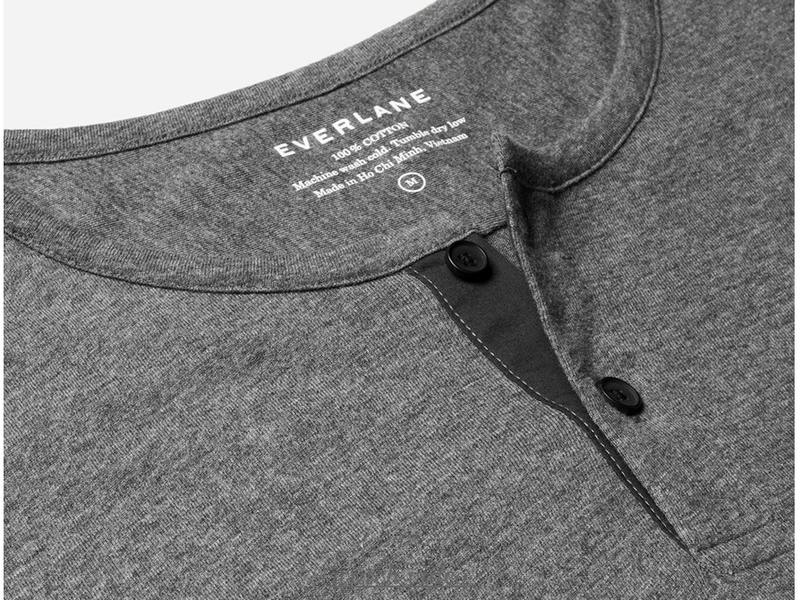 One of Everlane’s latest product launches has easily been one of their most anticipated. When looking at the types of basics they’ve been putting out, this is a move that just makes sense — a henley is a masculine basic that can be layered all kinds of different ways (under a shawl cardigan or a v-neck sweater, to start) and brings to mind a certain rugged, old-time aesthetic. And given all the ways it can be worn in a neutral color like charcoal, this is a key pick — it meshes well with black jeans or dark denim and sturdy boots, in addition to chinos. Plenty of sizes are available right now in charcoal and other colors (almost shockingly so), and the price is excellent — lower than a comparable J. Crew staple, for example. (Note: Look for an in-person review of one of these in white in the coming weeks). An underrated style basic in a unique color. So the second item on this list keeps to the theme of darker-colored neutrals, which Everlane seems to do so well. 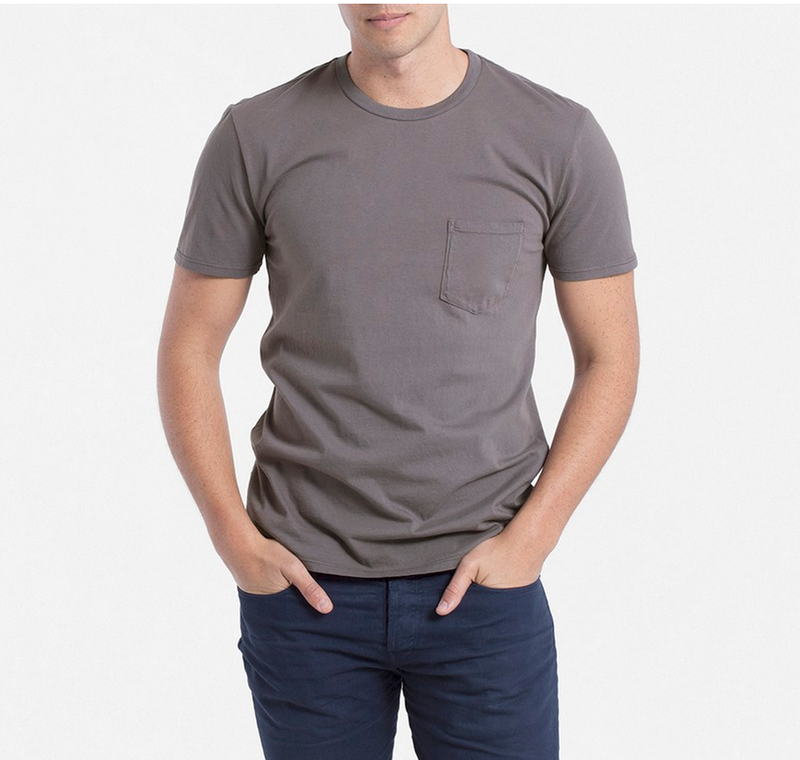 While this is just a simple pocket tee, that item is fairly underrated as far as a men’s style piece. While short-sleeve henleys are a wise choice as well, sometimes you want something with more structure — that’s where the pocket tee comes in. It looks different than a traditional crewneck because of that chest pocket, and the unique color helps it stand out from more basic options as well. This T-shirt would pair well with slim dark denim or a pair of navy trousers on the more hi-low spectrum of style; it also acts as a good neutral with some colored shorts. Don’t forget about the terrific price either — if Everlane is to be believed, comparable shirts retail for more than two times as much. A rugged staple for fall and winter — at a nice price, too. There are so many good reasons to keep your closet stocked full of classic essentials like white OCBD’s and chambray shirts, yet in the fall and winter, it’s also handy to have a great denim shirt on-hand. 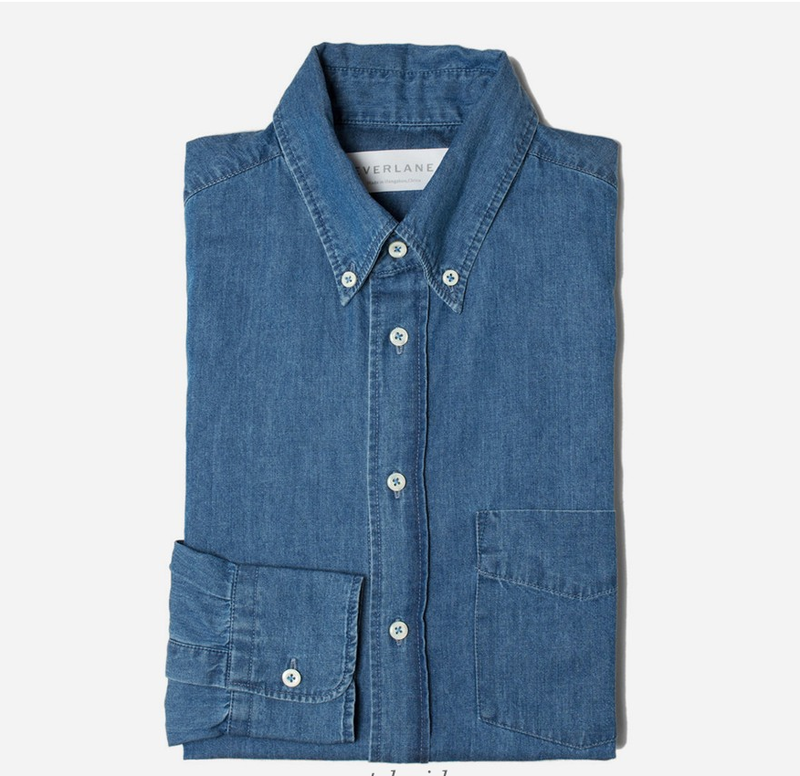 Everlane also makes a deeper indigo denim shirt, and they just started selling a grey denim number, too, but the real gem of their collection is this medium denim option. It’s less overtly trendy than something like a light-wash denim shirt, and it goes with more pairings, too. It would fit perfectly with broken-in khaki chinos in either the fall or winter, and it would add a rugged, dressed-down appeal to charcoal trousers, too. This particular wash would also stand out well with black denim and a rich wool tie. The price is very favorable when compared to a more expensive option from J. Crew, as well. A color not typically seen on most polos, at a reasonable price. It might not exactly be polo weather right now for those of us in the north of the U.S. and in other cold climes, but within a couple months, it’ll be more than time for some short-sleeves. The great thing with Everlane is that they seem to keep inventory well-stocked and prices fairly consistent, so you could expect polos like these to stick around for quite a while. The fit on these looks to be solid — trim but not too tight, although one wonders if the photos shot on the model weren’t shot about a size too big (most of us prefer a slimmer-fitting polo at the sleeves and through the body). 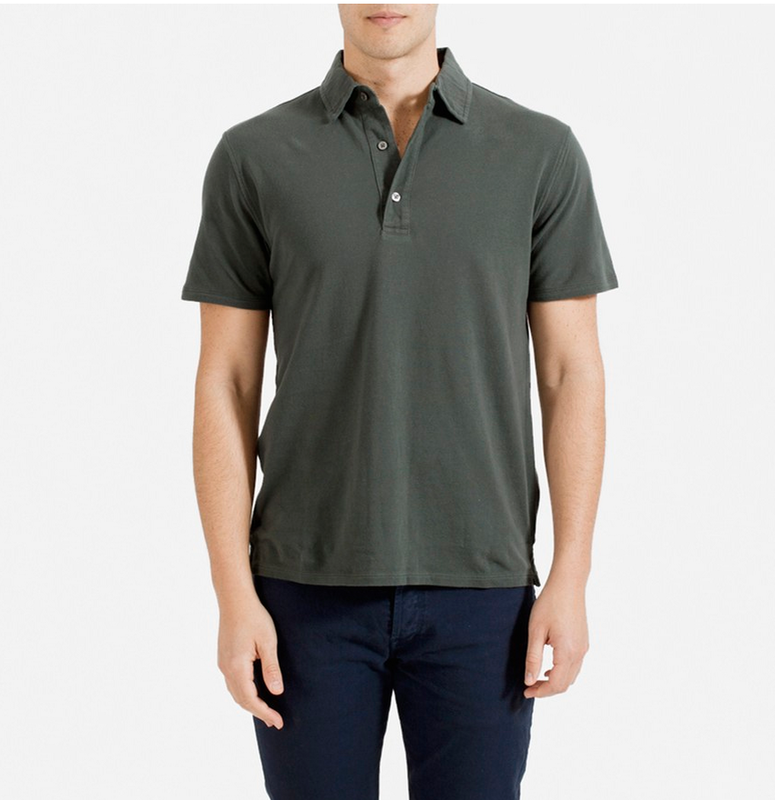 This particular item also comes in a color not seen tremendously often on polos — the deep hunter green would mesh well with wardrobe staples like tan chinos, and it would even sit right at home with lightwash jeans for the warmer months. For those who want to travel with style in mind. No mention of Everlane would be complete without examining the brand’s gear — these pieces are what put them on the map for most of us style-conscious guys, and it seems like they’ve built up their apparel from around their bags, curiously enough. The theory would hold that dressing well goes hand-in-hand with what you carry for travel and everyday use, and these bags hold up that end of the deal quite nicely. These pieces, particularly the reverse denim weekender pictured above look crisp, clean and simple — the solid colors and lack of ornamentation or logos mean they’re not overly gaudy. From personal experience, the weekender bag is definitely meant to handle short spurts of usage — mine got used pretty hard across a summer in NYC, and I ended up replacing it with this bag instead. However, for those who need a true weekend bag, these pieces look outstanding and should provide just enough space for travel essentials. Most importantly, the price quite honestly destroys options from comparable brands. 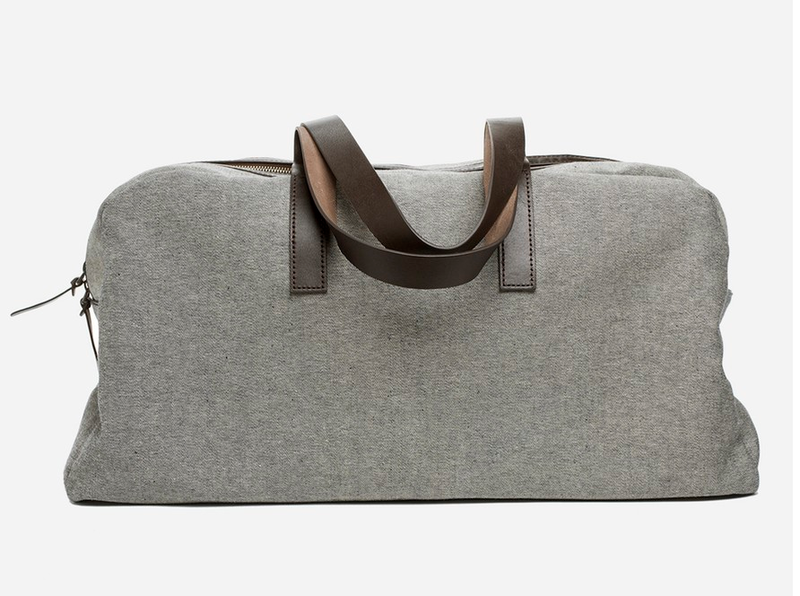 This isn’t built like a heritage bag from Filson, to be sure, but it should work just fine for the price. Most notably with Everlane, an entire outfit, from apparel to accessories, could be built from the Everlane website, down to your wallet — that’s the sign of a brand catering to the needs of customers while keeping style in mind. And finally, a quick thought for all of you into Kickstarter clothing projects — be sure to check out Tom Cridland’s ongoing campaign — they’re a British company trying to break into the U.S. market and offer slim chinos in standout colors, including a nice deep navy option. Expect an in-person review of those within the coming days! Have you bought from Everlane before? What’s on your wishlist from the brand? Let me know and thanks for reading! January 27, 2015 by Beau H.
Reviewing an up-and-coming skincare brand. While lots of us put care into our appearance and overall style, there are parts that seem to get overlooked (speaking from personal experience here) — namely, skin care! It’s part of the full package in terms of taking care of yourself physically and mentally, and it’s probably even more important than the clothes you wear — after all, it’s an indicator of overall health. 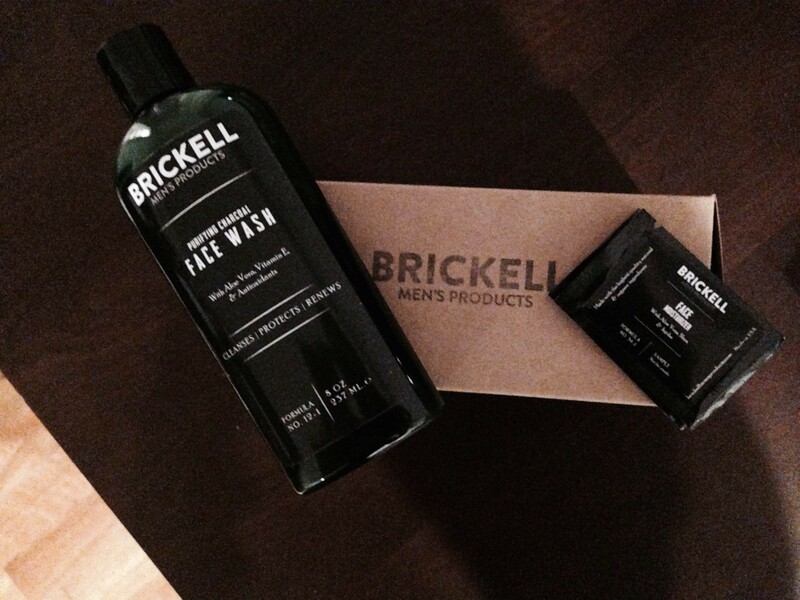 A terrific post from our friends over at Effortless Gent really got me thinking about this concept — Josh from Brickell Men’s Products preaches the importance of developing a daily skincare routine (and using high-quality products, like those from Brickell, to do it). Given the EG-approved recommendation, that was enough for me to take the plunge myself. I picked up the Purifying Charcoal Face Wash and added in a sample of the brand’s Daily Essential Face Moisturizer for Men, both using a discount code related to Effortless Gent (the brand is currently knocking 15% off your first purchase if you sign up via email). They rolled into my mailbox about a week ago, giving me ample time to test them out — and the results are in! Now the brand has gotten quite a bit of press across the past few months, so those testimonials would be an excellent source to check out, too. 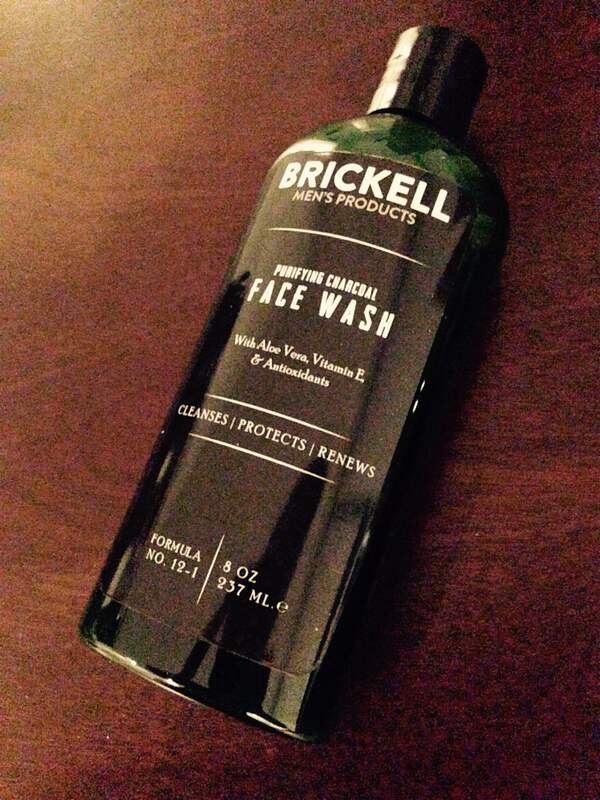 Charcoal face wash that capitalizes on a recent skincare trend (with good presentation, to boot). 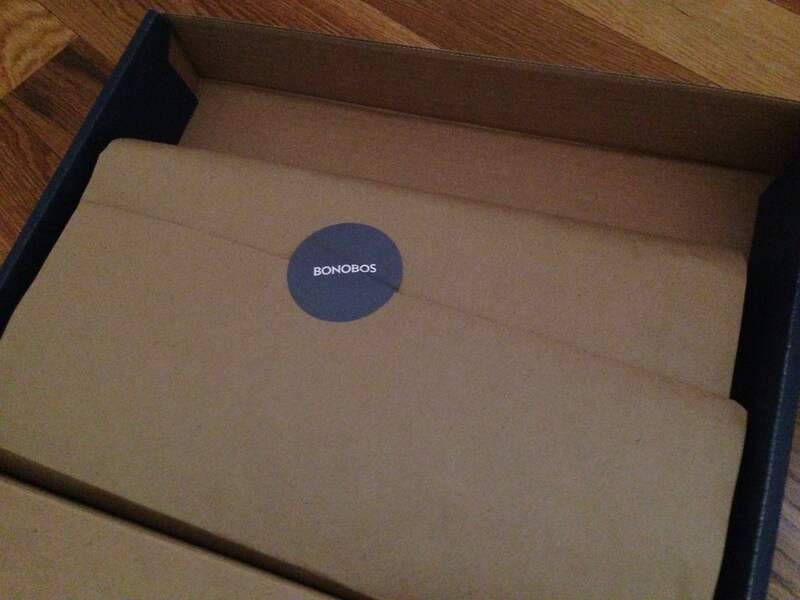 The first thing that jumps out is the packaging, seen at the top of the page. The cardboard box is crisp and sturdy, stamped with a masculine logo, much like other guys’ skincare brands out there — not that that’s a bad thing, by any means. The full-size face wash bottle is a nice, deep emerald green color – a small detail to be sure, but that makes it pleasing to look at. Other products on the site feature either that same green shade or a deep red bottle color. As to starting to use the product itself, there weren’t any visible directions on the bottle (not that many are needed for face wash, anyhow) — but that was rectified with a tips email that came the day after the package was received, outlining best practices for using the charcoal face wash. For the record, using a dime-sized amount of product with warm water works best to wash your face, followed by cold water to clean off. Charcoal face wash on the left, with a moisturizer sample on the right. Pairing the face wash with the moisturizer immediately thereafter (and following that process twice a day) has yielded some pretty pleasing results. I’ve noticed that despite the cold winter weather, my face doesn’t feel dry – using both products helps a great deal with beating winter skin irritation. Neither product drys out the skin either, something that can be an issue with other skincare products. While I’m no expert in skincare by any means, those are definitely positives to using these products. I’d expect that that same quality extends elsewhere, too. In the future, I’m definitely inclined to purchase a larger version of the moisturizer, and I’d definitely add other products — like the shampoo or the body wash. Note that they also produce, among other products, a full line of shaving items (minus the razor and blades), and travel sizes for each. Pricing is comparable to other skincare brands for like products (in this case, the moisturizer is slightly pricier than the Jack Black option because Brickell offers a larger bottle). Knocking off 15% on your first order is definitely preferable at the moment, but extremely frequent refills shouldn’t be needed — so this option hopefully won’t stretch too many budgets. They’re definitely a solid bet among several other competitors — going with a surefire option like this could be a great way to complete an overall lifestyle routine. What are your skincare steps? What products would you recommend? 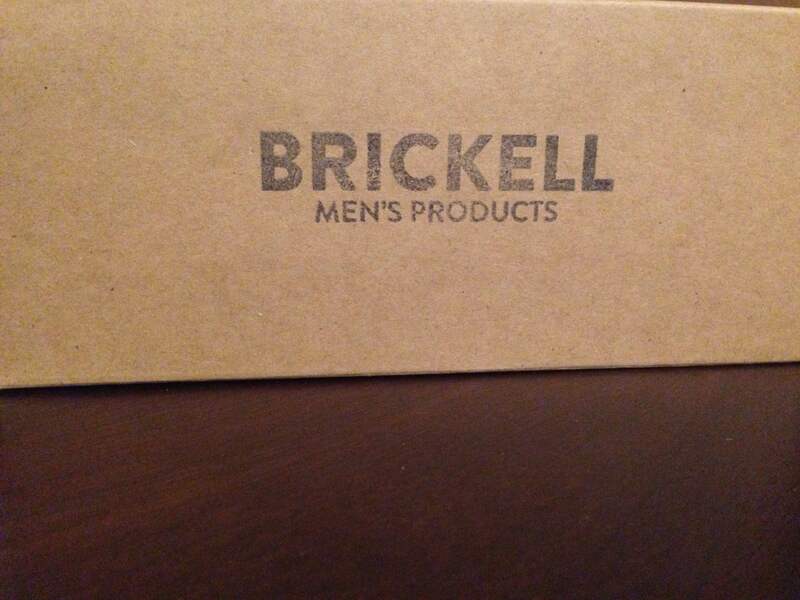 Any experience with Brickell Men’s Products? Leave your thoughts below! January 22, 2015 by Beau H.
Editor’s note: In the interest of full disclosure, the author interned with Bonobos this past summer. This review is completely impartial and in no way influenced or sponsored by Bonobos. Reviewing a much-loved pair of jeans from a much-loved company. This time of year, it’s easy to get into a style rut. We’re long into a chilly winter — and most of us are probably jealous of those in warmer climates! The novelty of wearing thicker winter fabrics could very well be getting old, and even reaching for dark denim might not provide enough style inspiration on most days. Fear not, though; plenty of options are out there for changing up how you start your outfit — namely, with your pants. 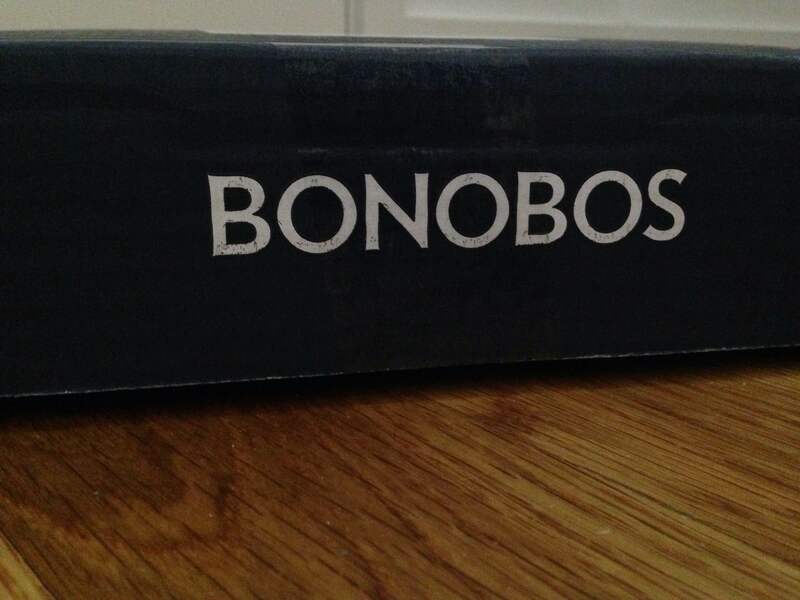 If you’ve had any experience with Bonobos, you know the drill. Renowned for the fit of their chinos and increasingly known for their relatively recent expansion into tailored wear and other stylish items, Bonobos’ Travel Jeans have generated lots of buzz, too. As renowned for their presentation and customer service as the fit of their pants. In fact, they’re about as tough to beat for a pair of versatile jeans as any on the market. And that versatility starts with the huge array of color options they offer — absolutely essential to shaking up a winter wardrobe with some different shades. 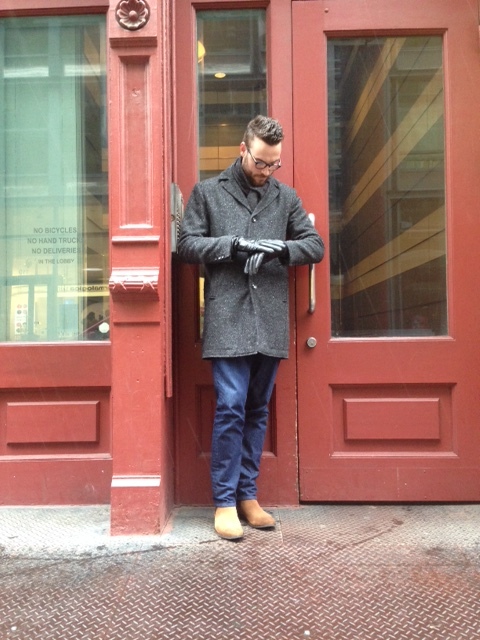 In particular, their Allegheny Oak Travel Jeans provide great cold-weather color and an outstanding fit. Offered in four different fits (Slim Tailored, Slim Straight, Straight Leg and Boot Cut), the full spectrum offers something for just about everyone. And the colors are completely on-point as far as fall and winter dressing — from a rich burgundy to a slate green color to a nice faded tan (or “sand” color), several options should go well with other shades like charcoal or deep navy this time of year. The Allegheny Oak shade would pair up perfectly with other fall & winter colors. These travel jeans live up to their reputation, as well. The fabric has a nice thickness to it, yet retains more than a hint of stretch — the folks at Bonobos had easy transport in mind, clearly. This specific pair comes in the Slim Tailored cut — after trying a Slim Straight cut in the same size (and in the more summer-appropriate Bering Blue) last year, there was slightly too much room in the waist and thigh for my liking, thus leading to the Slim Tailored option. The fit is exceptionally similar to their Slim Tailored Washed Chinos. A closer look at the detailed label now sewn into newer Travel Jeans. And this iteration of the Travel Jean is superior in other ways, too. 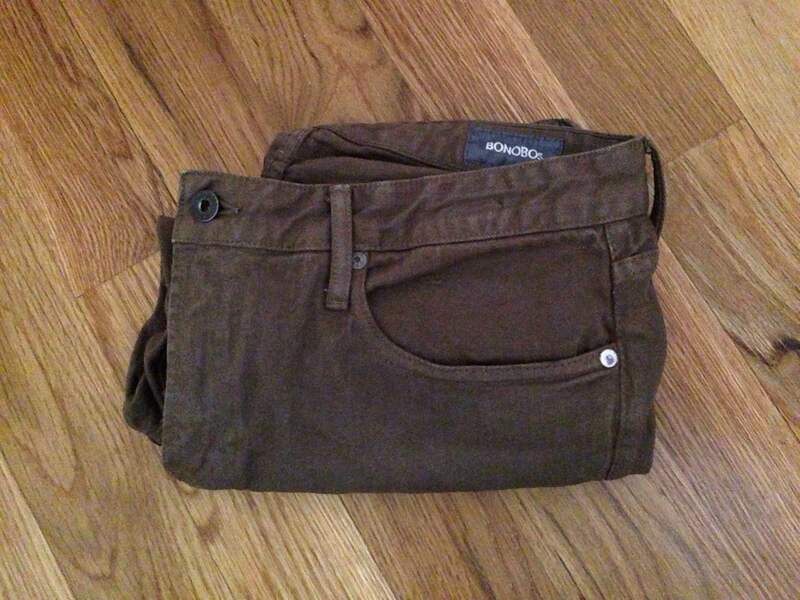 There’s a detailed label sewn into the back pocket, along with white stripes on the interior of the brown pockets. The fit is, of course, more tailored than the Slim Straight option, making it easy to wear and move around in. As far as versatility goes, these strike the ideal balance between being too dressed-up and too dressed-down. The five-pocket construction, while not incredibly formal, would work in business casual settings with a well-tailored blazer in multiple shades — from light gray to a heightened blue. Because these jeans are a lighter brown, they would even coordinate well with darker brown leather — like these sneakers or virtually any of the options discussed here. These jeans are also made for wearing with a shawl or color-blocked cardigan and, say, a navy henley casually. Last but not least (and perhaps more importantly for those of us on a budget), most of Bonobos’ Travel Jeans are going for $78 on-sale (knocked down to under $50 with a 40% off code). That’s a terrific price for a pair of pants that are more versatile than a standard pair of dark denim — well worth it given Bonobos’ quality. 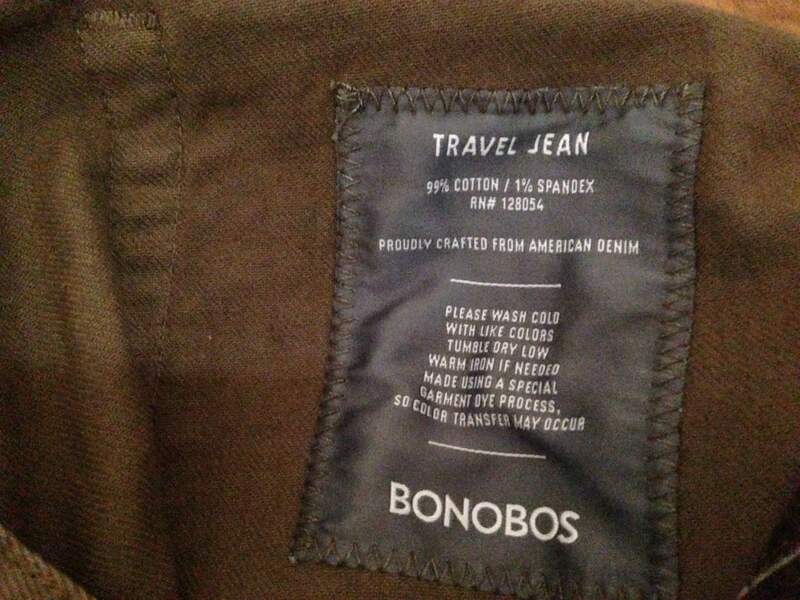 Own any Bonobos Travel Jeans? Or their Chinos? Thoughts? Leave it all below and thanks for reading! January 19, 2015 by Beau H.
Reader Giveaway Contest, Part 2! Shake out those Monday blues with a follow-up to last week’s reader giveaway contest! A big thanks to all of you who read the post and more importantly, a huge thanks to those of you who left your thoughts regarding your top picks from EastDane.com (pretty great site, huh?). A huge congratulations to our winners (who’ve already been notified via email): Jesse, Jared, Cameron and John! And to the rest of you — please keep your eyes peeled for future giveaway opportunities! Coming up later this week on the blog, expect a review of Bonobos’ much-lauded Travel Jeans, this time in a very fall and winter-appropriate shade (and while you’re at it, check out the Bonobos website for what looks to be a very advantageous ongoing sale). In the meantime, stay awhile on the site, peruse the archives at your leisure and keep it stylish! January 15, 2015 January 19, 2015 by Beau H.
When one surveys the world of online men’s retail, there seem to be two main approaches out there in the digital realm — traditional brands who go brick-and-mortar and use their websites as an extension of the brand (like J. Crew, for instance) and brands that aggregate lots of other great brands into specific categories under one roof. Plenty of sites have undertaken that mission, but East Dane is one that’s particularly new (and noteworthy) in the world of men’s style. Launched in 2013 as the male partner to the female-minded Shopbop.com, they take an extremely well-curated approach to men’s fashion — mixing heritage brands alongside high-fashion outlets equally well. They offer everything imaginable under the sun (and in the snow), from stylish boots to men’s jackets. They’re even offering 50% off men’s products on the site — knocking a decent number of prices into attainable (but still splurge-worthy) territory; note that this is a section that’s live on the site all the time. There’s an even better way for you to get in on the fun though, thanks to an East Dane giveaway I’m running alongside Nak Online Branding! Just let me know your favorite product from the East Dane site in the comments below (feel free to include a link, if you’d like! ), and 4 winners will be chosen at random to receive a $50 East Dane gift card! This is a pretty neat opportunity to knock some cash off that investment piece you’ve had your eye on. Let me know your thoughts below and thanks for reading! UPDATE: Thanks to everyone who participated and left comments below! This contest is now closed, but look for future opportunities within the coming weeks and months. And most importantly, congratulations to our winners: Jesse, John, Jared and Cameron. Thanks again, and stay stylish! January 9, 2015 January 9, 2015 by Beau H.
Editor’s note: Occasionally, this site will cover what you should (or could) feasibly wear for specific situations, outside of holidays and other big events — consider this a combination style suggestion and a look into the author’s personal wardrobe. Ready for the cold weather (hopefully). Scarf by J. Crew Factory. 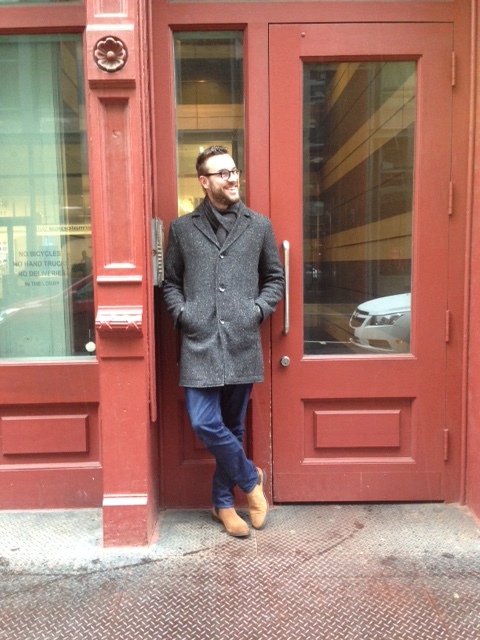 Overcoat by Kenneth Cole. Gloves by Target Merona. Today (at least in New York City and across much of the rest of the country), it’s winter in full force. A huge winter storm hit a large swath of the country earlier this week, and while NYC was lucky to escape major snowfall, we’ve got some snow on the ground here now. Given that, it seemed as perfect a time as any to break out the below boots — a thick, sturdy, dependable pair of Wolverine 1000 Mile Austen boots in a utilitarian black (for a full review of the boots, head here). Combined with some other winter-centric touches as outlined in the above photo, I’m all set for today’s cold weather. Reaching for a similar combination, if you work in an office, should keep you warm from car to office, or subway to office, or from the bus to the office … you get the drill. 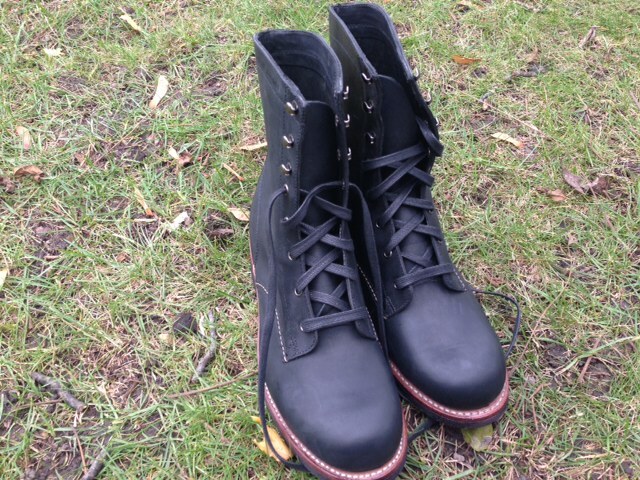 As reviewed in 2013: Wolverine 1000 Mile Austen boots in black. The perfect shade and style for a winter day like today. 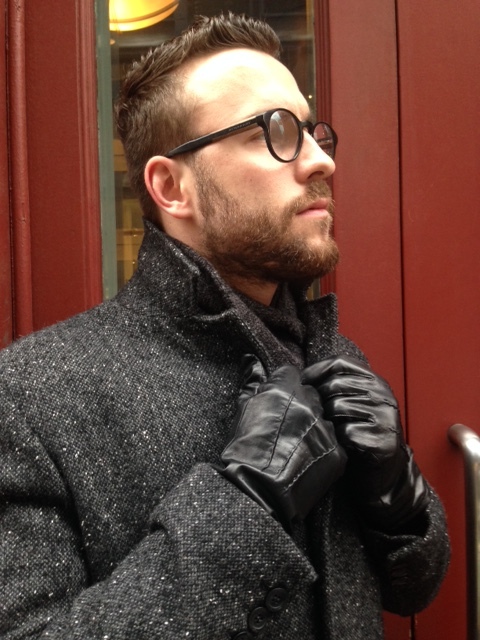 A thicker coat (potentially with an added zip-up implement, like this Kenneth Cole option pictured) could add some extra warmth while also maintaining a streamlined silhouette. There are other great ways to stay stylish and warm in the cold weather, too. Thicker textures like chambray stand up well to chilly temperatures, and layering with a shawl cardigan or v-neck sweater (I’m personally wearing a beige J. Crew Factory v-neck sweater today) could also do the trick. If you feel a hat is warranted, there are plenty of cheap options out there from, for example, H&M. And when wearing sturdy boots like the thick ones above, some slightly heartier ribbed socks would also fulfill two functions — keeping your feet warm and fitting in stylishly with other portions of your outfit. Above all, do your best to stay warm — but keep some style ideas in mind for colder temperatures! And in other slightly related business, keep your eyes open for an upcoming giveaway opportunity in partnership with East Dane. This post should be hitting on the site within the next two weeks! What are you wearing in today’s chilly weather? Any further style tips or suggestions? January 6, 2015 by Beau H.
While there’s nothing wrong with a great pair of lace-up boots, there’s something inherently sleek and stylish about the Chelsea boot. 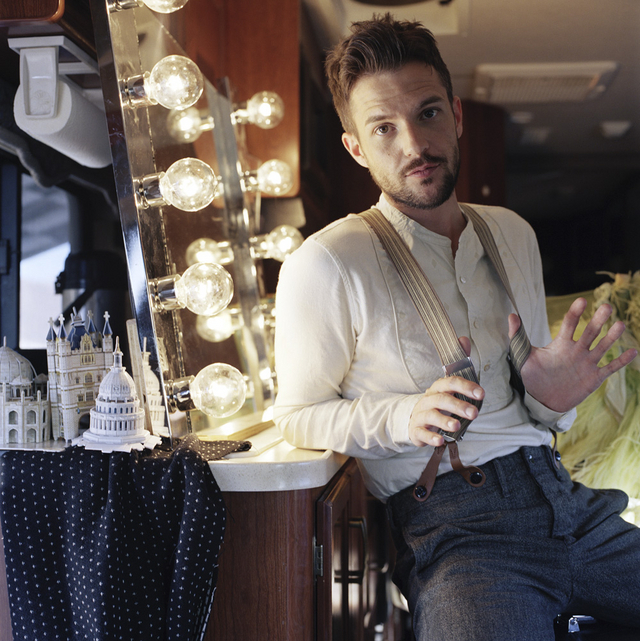 It’s a silhouette that’s garnered a lot of attention across the past year or so in the men’s style arena, and it’s also unique in the fact that it’s a classic style, too. First pioneered in the mainstream style arena by, among others, The Beatles and now worn by current British rockers, they’re an on-trend, continental style with staying power. While Chelsea boots can be incorporated into all kinds of outfits across the seasons (including suggestion #3 in this outfit post), perhaps the best time to wear them is the fall and winter, when temperatures dip. Take a page out of David Beckham’s book and rock them in all different kinds of situations — even at a fashion collaboration launch party. The boot’s higher cut pairs well with sturdier, thicker pants fabrics — think slim flannel, corduroy or garment-dyed jeans. That’s not to say they wouldn’t also look right with a simple pair of dark denim (see the photos here). This particular pair of Chelsea boots was a Christmas gift from Santa, and a great one at that — especially given that sizes are now nearly cleared out through ASOS. However, the same site offers plenty of alternative options in both leather and suede, and H&M makes a particularly noteworthy Chelsea boot, as does Frank & Oak. For the ultimate in dressy appeal, Frank & Oak’s black leather version is sleek. These ASOS boots check all the boxes of an excellent pair — they have a higher cut, making them ideal for fall and winter treks, and they tie in another cold-weather element, too: the use of suede. The rich tan suede color is extremely versatile, as it contrasts nicely with everything from dark blue denim to navy or olive chinos or charcoal trousers (note that any of those pants would be a terrific purchase even without a pair of Chelsea boots in your closet). And the dark tan color fits in with the equally dark colors of fall and winter (in colder regions of the country, at least), while also standing out in the right way — as you can (hopefully!) see in some of these photos. It’s also worth noting that dark tan suede pairs just as easily with brown or black accessories in terms of your belt color or watch strap — that’s two for the price of one! Noting the time on an Invicta Pro Diver watch. Not pictured in this casual outfit — Navy crewneck sweater (J. Crew), Pocket T-shirt (American Apparel). In this instance, I kept the outfit relatively simple — slim blue denim, a charcoal overcoat (now out of stock but a tremendous value on-sale) and a navy crewneck sweater over a charcoal pocket T-shirt. Of course, winter accessories were also key to have on-hand (while that scarf is out of stock, a similar option can be found here, while those Target gloves were a steal on-sale). And the great thing is that although this is a casual outfit, these Chelsea boots would look just as sharp with some heavier, winter-weight suiting or even the charcoal trousers as linked above, along with a V-neck sweater and chambray shirt. 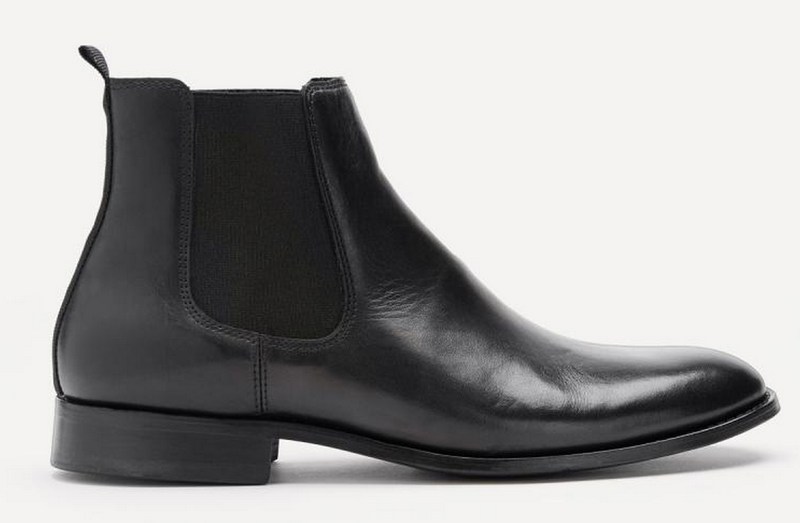 Have you considered picking up a pair of Chelsea boots? What brand would you recommend? Let me know!